After the burning of Moscow, Vasya finds herself about to be burned after being accused as a witch. Events are spurned by Father Konstantin whose hunt for Vasya is relentless. In the mortal world, war is brimming between the Russians and the Tartars, and in the realm of magic, the fight between the Winter King and the Bear only grows more desperate as the chyerti fight for their existence. The Winter of the Witch is far more than I had expected from Katherine Arden. Imagine a Joan of Arc slash The Hunchback of Notre Dame type of scenario. 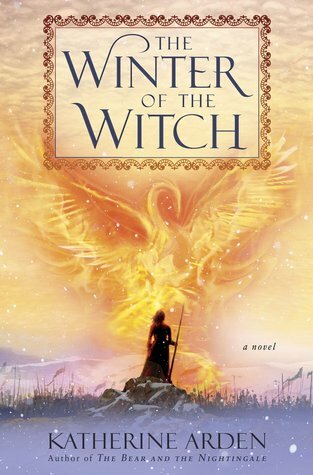 The Winter of the Witch reads like three different storylines – beginning with Vasya’s search for Morozko, the battle between Morozko and Medved, and finally, the Battle of Kulikovo. When we first meet Vasilisa Petrovna in The Bear and The Nightingale she is only a girl darting between trees, abused by her step-mother, and unsure of herself. In a time when Catholicism is invading Rus’ and the old traditions are being condemned as demonic, Vasya finds herself ensnared in the fight between the Winter King and the Bear. The Winter of the Witch brings back the whimsical and dark atmosphere I had loved about book one. But unlike The Bear and The Nightingale, Vasya has grown into a harder, almost unrecognizable character. Through Vasya we come to understand that women are allowed to be both selfish and selfless. Just as Vasya fought for her family, she also fought for her own glory. In a time when women are expected to be one or the other, reading The Winter of the Witch seemed to cement the idea that being fearsome doesn’t necessarily mean we are void of tenderness. Set in a time when Catholicism is invading Rus’, the chyerti find themselves beginning to disappear. The Winter of the Witch highlights how religion becomes a means to dismantle a cultural system. Father Konstantin is, by far, one of the most interesting villains I have read. He is so painfully human; his warring desires between lust and divinity, between repentance and power. One of the saddest things I read about Father Konstantin is how he felt neglected by his God so much that he turned his face to the devil. And then we have Brother Aleksander who does not shy away from expressing his disgust about what he considers paganism. Yet, in spite of this, he walked a separate path from Konstantin. Both he and Konstantin may not have understood or agreed, but where Konstantin failed, Aleksander prevailed simply by accepting. He accepted Vasya as a witch. He accepted that there is a different power from the one he believes. I really loved the portrayal of Father Konstantin who, in spite of his wickedness, is filled with fear and self-hate. He looks at Vasya as the enemy solely because he cannot have her. Doesn’t that just sound like a dangerous road to travel? During the previous two books, I was all but ready for the Vasya and Morozko storyline. So when it did happen, I was ecstatic! It was such a slow burn romance that gave me goosebumps…but you know what, I was surprised to find that Vasya and Medved’s relationship – and that is putting it mildly – interested me far more. Medved is every bit the wild spirit Vasya wants to be. I imagined him as the anger of every woman who has been silenced. The need for violence and chaos is strong in the displaced minority and yet like Vasya we have to tame this madness. We learn to be merciless without being cruel, we learn to protect the vulnerable with a vicious streak, we learn that a little cunning and compassion can go hand in hand. The Winter of the Witch is less a story of imagination but more of a social commentary on a world that demonizes women and non-Western cultures. We move from fear stricken Moscow to a hypnotizing place called Midnight, we meet fearful creatures and mushroom grandfathers, we experience love and forgiveness, and devastation but also peace. The Winter of the Witch brings the trilogy to a bittersweet ending with characters who continue to burn bright. The Winter of the Witch is breathtakingly beautiful to read – its description of Rus’ and the fairytales woven together on the fingertips of a green eyed girl. Have you read the Winternight trilogy? What do you think of Katherine Arden’s prose? Would you choose to be a witch, a winter demon, or a chaos spirit? Why? Ooooh, I loved the first two books and your review makes me very excited to read the winter of the witch!!! I loved this book, and thought it was a beautiful ending the trilogy. Glad you enjoyed too! This is a really fantastic review Camille, and puts into words everything I feel about this book! It truly exceeds my expectations, and yeah I agree! I love how every character are explored deeply that we can’t categorize them into the good and the bad. Medved really interest me in this book, he seemed so different from the monster he was in the first book, and more… human (?) with his desire and quips and knowing Vasya so well. Great review. I really should get around to reading this book. Oh, I didn’t realize that. Thank you for pointing it out!